Art Gallery of St. Albert features contemporary and community exhibitions, brought to life with public programs and events. Education programs offer visual arts opportunities for thousands of children, youth and adults throughout the year. Art Gallery of St. Albert’s mandate is to provide enriching educational experiences that celebrate visual culture and artistic achievement through research, exhibition and interpretation. Exhibitions celebrate diversity, providing vision, inspiration and education for the community. Art Gallery of St. Albert and Musée Héritage Museum are managed by Arts and Heritage St. Albert, a non-profit, registered Canadian charitable organization. The charitable number is 868543331 RR0001. Please request charitable tax receipts for donations. 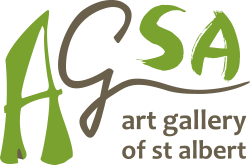 Click here to view Annual Reports which contains information on Art Gallery of St Albert’s exhibits, programs and events.